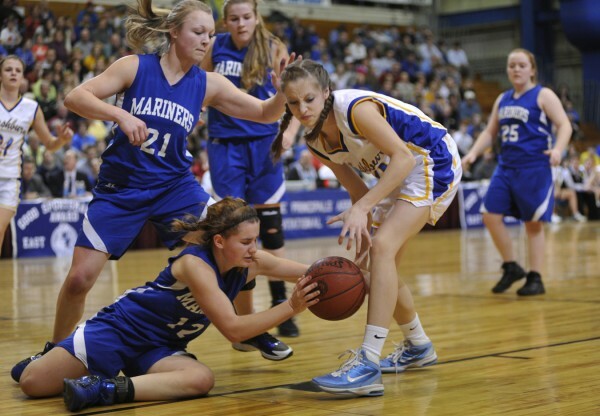 Deer Isle-Stonington’s Heidi Brewer (left) and Washburn’s Carsyn Koch battle for the ball during last year’s Eastern Maine Class D final at the Bangor Auditorium. Washburn won the regional final and went on to capture the state crown. It is the No. 1 seed entering this year’s tourney. As the defending state Class D girls basketball champions, the Washburn Beavers have been targeted by their opponents all season, according to coach Mike Carlos. His team withstood most of those challenges while posting a 17-1 regular-season record and earning the top seed for the Eastern Maine Class D girls tournament. Aroostook County teams dominate the top of the standings as Fort Fairfield (14-4) is seeded No. 2, followed by Central Aroostook (14-4) of Mars Hill and Van Buren (15-3). Preliminary-round games are scheduled for Tuesday, and Washburn is the only playoff team which isn’t playing one. Carlos doesn’t plan on overlooking any opponent, especially after the way Deer Isle-Stonington played last year. The Mariners were No. 6 last year and knocked off the No. 3 and No. 2 teams. “I think Woodland and Shead [of Eastport] will be teams to watch out for,” said Carlos of this year’s No. 6 and No. 5 seeds, respectively. Washburn is led by Mackenzie Worcester, who is averaging more than 22 points a game, Carmen Bragg (14 ppg) and Carsyn Koch, who has returned from a preseason knee injury and meshed back into the team well. Carlos also cited the play of Olivia Doody and Joan Overman. And Washburn is young. Starters Worcester and Overman are freshmen, Bragg and Koch are sophomores and Doody is one of two juniors, the only upperclassmen on the squad. “We’ve matured” over the course of the season, Carlos said. Fort Fairfield coach Larry Gardner is well aware of the uphill battle teams face in trying to topple Washburn. Matt Rossignol, whose Van Buren team was the only one to defeat Washburn in the regular season, agrees. Rossignol’s daughter, Parise, a sophomore, leads the team in scoring (30 ppg), rebounding (8.5) and assists (8.1). “[She] has continued to expand her game,” he said, but she can’t do it alone. “Felicia Bouchard, you can’t really call her a freshman anymore, she’s playing with confidence, and [senior center] Ashley Wilson is our second scorer,” he said. Rossignol’s main tournament concern is that none of his players have played in the Bangor Auditorium, site of the EM tourney. “If we can survive the first three minutes without getting down 12-0 or something like that, I think we’ll be OK,” he said. But Rossignol doesn’t dare look that far ahead, either. “There’s not a weak team in [the field],” said Gardner. Washburn, though, is in a good position to achieve a preseason objective. “Our No. 1 goal was to make it back to the tournament,” he said. “But deep down, we wanted to repeat.